Urine formation begins with the delivery of blood to the glomerulus followed by its filtration past the glomerular barrier. The filtered portion of plasma continues through the nephron whereas the unfiltered portion passes into the peritubular capillaries. 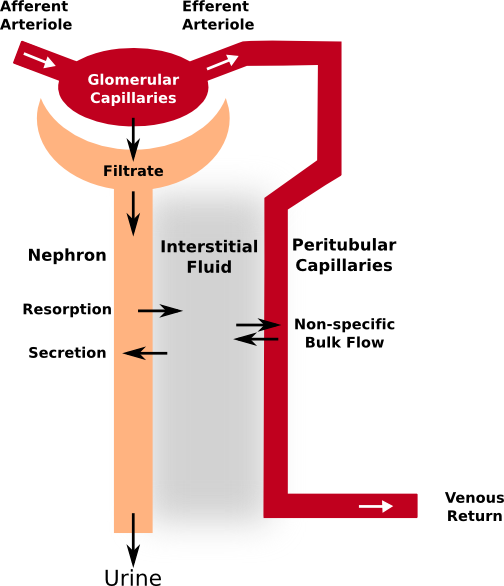 As the filtered portion travels through the nephron, water and certain solutes are resorbed back into the peritubular capillaries whilst other solutes are secreted from the peritubular capillaries into the nephron. Whatever fluid is remains at the end of the nephron is discarded as urine. Here we discuss the basic mechanistic that which are involved in formation of urine. Blood enters the glomerulus via the afferent arteriole and leaves via the efferent arteriole to enter the peritubular capillaries that surround the nephron. The glomerular filtrate then enters the nephron and travels through it. At the different stages of the nephron the filtrate is modified by mechanisms which specifically resorb or secrete small molecules including water, into or out of the filtrate. These molecules enter the interstitial fluid where they non-specifically enter and exit the peritubular capillaries. Whatever fluid and molecules remain in the nephron at its end are excreted as urine.